If you have been on the lookout for where to land your dream beach vacation, put away your spyglass, for it has been discovered at Ship Watch Pointe II in North Myrtle Beach, South Carolina! This lovely resort is a sprawling three-story rental condominium complex in the charming Shore Drive area of North Myrtle Beach. Studded by palmettos and lush landscaping, the resort exudes life at the beach. Inside, the rental condos are spacious and comfortable, a perfect home away from home as you enjoy your vacation getaway. Meandering throughout the resort, feel the everyday stresses and troubles slide away, allowing yourself to focus instead on all of the great amenities Ship Watch Pointe II has to offer you and your family and friends. With the glittering indoor and outdoor pools and the luscious outdoor hot tub, the demands of life you left behind will quickly move to the back of your mind, where it belongs! 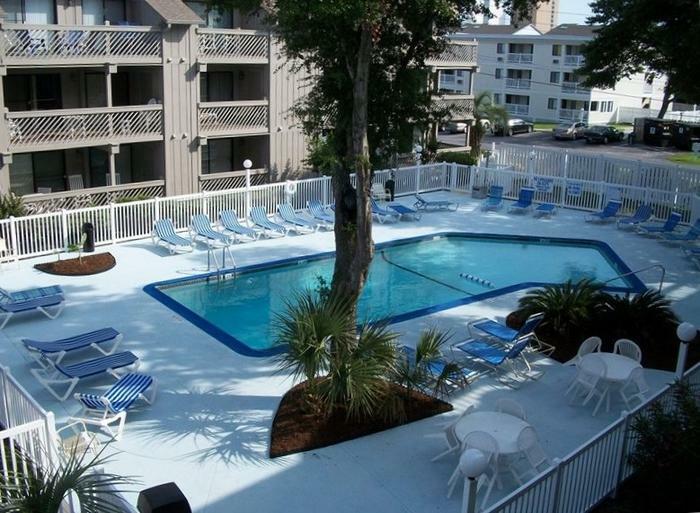 Each of the rental condos is crowned with a well-equipped kitchen and features generous balconies overlooking the alluring Shore Drive area of North Myrtle Beach, South Carolina. If you would rather be cooking outdoors, there is a covered grill area for you to flip some juicy burgers or char some freshly caught local seafood. Spend your days poolside or take a short walk to the beach, where the ocean surf will dance about your ankles, and your toes will sink happily into the sand. Your Ship Watch Pointe II resort condo is located near a wealth of North Myrtle Beach restaurants, shopping, and attractions. Here, you will never be bored unless you choose to be! The resort is within walking distance to Apache Pier, the longest wooden pier in the East Coast. It is a gorgeous place just to walk along, with or without a fishing pole in tow. Other fishing opportunities abound in the area, along with tackle shops to rent some gear. If golfing is more appealing to you and your group, choosing a course will be a fun experience in itself, as there are over 100 courses from which to do so! Art and music connoisseurs will love the live entertainment options at the Carolina Opry, Alabama Theatre, House of Blues, and other locales. Ship Watch Pointe II places you in best seat of the house in terms of comfort and easy reach of all the best a North Myrtle Beach, South Carolina, vacation has to offer! Elliott Beach Rentals is not affiliated with onsite management or the HOA of Ship Watch Pointe Ii.